"Financial literacy is the ability to understand how money works in the world: how someone manages to earn or make it, how that person manages it, how he/she invests it (turn it into more) and how that person donates it to help others"- via Wikipedia. 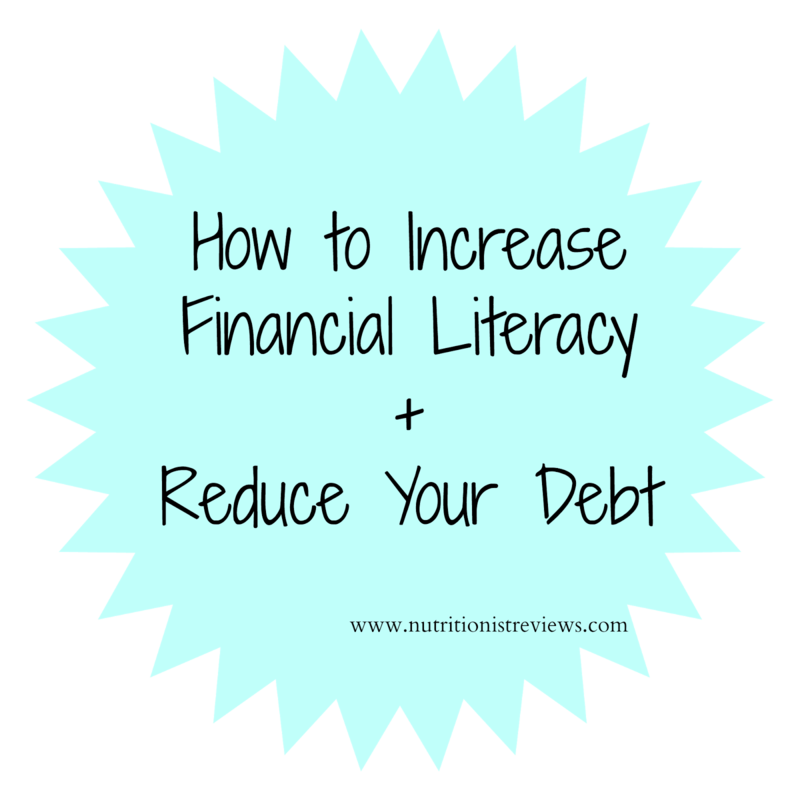 Financial literacy is something that is very important to me. From an early age, my parents taught me to be money savvy. I was given an allowance, taught to save, taught to shop deals, etc. This is something that I use in my everyday life and am so happy to know. Due to being financially savvy, we have been able to pay off all of our outstanding student loan debt ($34,000!) which we are so proud of. This money did not come from earning a ton- in fact, not at all. This money came from limiting unnecessary expenses such as expensive dinners out, salon appointments, spending on designer clothes, etc. We were able to pay off our debt quickly by focusing on our overall goal which was to pay off our debt. It took somewhere between 2-3 years to pay off that debt and much of that time, Troy was working at AutoZone and I was in my internship (not earning anything). I feel like if I was not a dietitian, my second choice of career would be working in some kind of finance teaching people to save money. It is something that I am very passionate about and have quite a bit of knowledge in. I am always trying to learn more about finances in order to help us make the best decisions for our financial future. One thing that I do is consult my financial advisor for things that I may be confused about or need an opinion on (AKA, my dad!). We are always trying to lower our monthly costs. Also, staying up to date on different ways to save, interest rates, etc. can all help to increase financial literacy. Massachusetts Mutual Life Insurance Company is helping celebrate Financial Literacy Month by helping people take small steps to secure their financial future and protect you and your loved ones. Small steps include identifying your short and long term goals, talking to a financial professional and making a budget. These will help you to get on track to where you want to be. MassMutual has tools and calculators (retirement planning calculator), videos and articles to help increase your knowledge on finances. Take some time to write down long term and short term goals. A short term goal could be to pay off your credit card bill this month. A long term goal could be to save enough money for a down payment on a home. We currently do not have a specific budget but instead try to keep our expenses as low as possible. I know that for a lot of people, they do better with a specific budget- whatever works. About a month after Adalyn was born, we started to save for her college. This is something that my parents and grandparents did for me and it was amazing how having to worry about tuition during college. We put a certain about of money in the bank each month and hope to have a big chunk of her college paid for by the time she is ready to start. Troy manages this account and it is especially important for him because when it was time for him to go to college, he did not have money saved and even had to take a semester off due to not being able to afford tuition. Find out how much you need to save for your child's college with the college savings calculator. We want to teach Adalyn to be financially savvy and want her to have the right start when she goes to college. When she is old enough, we she have her own small allowance that she can save and spend a little bit. I want to teach her how important financial literacy is so she can be successful (not necessarily rich but not in debt). Although I could go on and on about finances all day long, I will stop here. Let me know, how do you increase your financial literacy? What are some of your best tips to save money (I would love to know! )?